This was part of an update we received from LinkedIn this week announcing the forthcoming revamp of the Groups feature in LinkedIn. 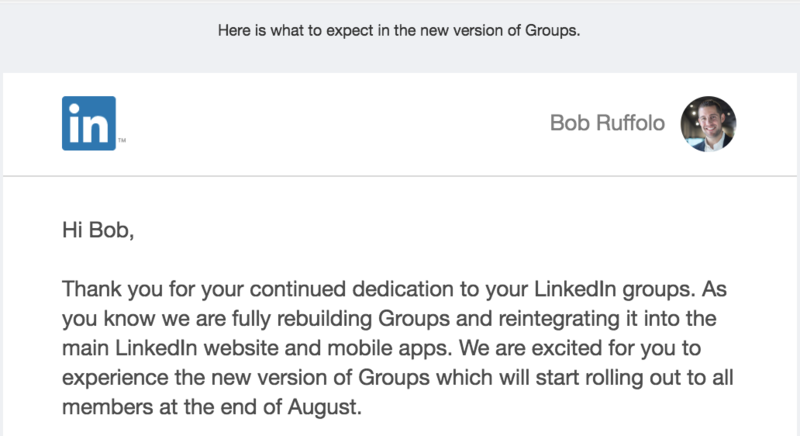 In the August 15 announcement, LinkedIn said they’re rebuilding Groups to make it more engaging and easier to use. We’ll start to see this new version of Groups by the end of this month. Toward the end of 2015 there was a massive overhaul of LinkedIn’s Groups platform. Since then, many noted a significant drop off in group engagement. This was partially due to the update making it more difficult to find new groups within the platform and partially due to the lack of notifications bringing people back to the groups they joined. As an admin of multiple groups, I felt the pain of this update. It seemed my groups were harder to find and get to (even for me as an admin) and they just felt generally hidden away like Harry Potter’s room under the stairs at the Dursley’s. In fact, in early 2016, HuffPost described LinkedIn groups as a ghost town. At this point, many groups (including many that I myself am a member of) became a pit of self-promotion and shameless plugs. Despite the best efforts of group admins, it just wasn’t a place where communities thrived. It was a place where people dropped links and promoted themselves. However, with over 2 million groups on LinkedIn at the time, there are many groups that have, to this day, managed to maintain a high level of engagement, quality content, and good discussions. In late 2017, we noticed that group icons were no longer appearing in a lot of Groups. Then, in February of 2018, LinkedIn took what we assumed might be a step toward phasing out Groups entirely and removed the dedicated iOS app for Groups. However, it turns out they were simply preparing to reintegrate Groups back into the main LinkedIn experience. According to the update from LinkedIn, they now have an engineering team dedicated to building admin functionality for Groups. Plus, LinkedIn Groups will be able to be managed directly from the iOS and Android apps instead of requiring an additional app. Not only are Groups not going away, they’re poised to make a massive comeback. The head of Trust and Safety at LinkedIn, Paul Rockwell, published a post in addition to Melissa’s, about how his team keeps LinkedIn’s members safe. Like many of you, I’ve experienced how inappropriate and unsafe social platforms can be at times. In fact, it’s one of the things that turned me away from LinkedIn the most. I’m happy to see LinkedIn’s dedication to building a safe and trusted platform alongside their investments in fostering community development. Bringing people back to LinkedIn groups likely won’t be easy. A solid first step is definitely to build trust among members. “We've heard from many of you over the past year that boosting engagement and enabling vibrant discussions in your groups is important, so we've prioritized features that support this,” states LinkedIn in their announcement regarding the update. It will now be easier to access LinkedIn Groups from the homepage and group conversations will get increased visibility in LinkedIn’s main content feed. Group activity will also be included in notifications, which will facilitate more discussion and conversation. Speaking of, the new features will also include the ability to reply to comments, edit posts and comments, and post native video to Groups. This will enable richer conversations and a more community-focused experience. LinkedIn says all groups will be automatically migrated to the new version and that the full functionality of Groups will be available from both desktop and the app. While the process of migrating all LinkedIn Groups to this new version is in process, LinkedIn said they have streamlined some administrative functionality. Moderation queues are temporarily unavailable. LinkedIn said they realize the importance of the tools and are working hard to release a vastly improved tool in the coming months. The moderator role is going away. Administrative roles for Groups will now be limited to owners and managers. LinkedIn shared that many users felt the roles were confusing and wanted them to be simplified. Once the change takes place, moderators will become regular members of the groups. You can, of course, promote your moderators to managers to avoid this change if you’d prefer. Auto-generated group emails (digests and announcements) will be unavailable while they are rebuilt. While this doesn’t require a change per se, some group owners plan email content in advance and are currently utilizing group digest emails and announcements. 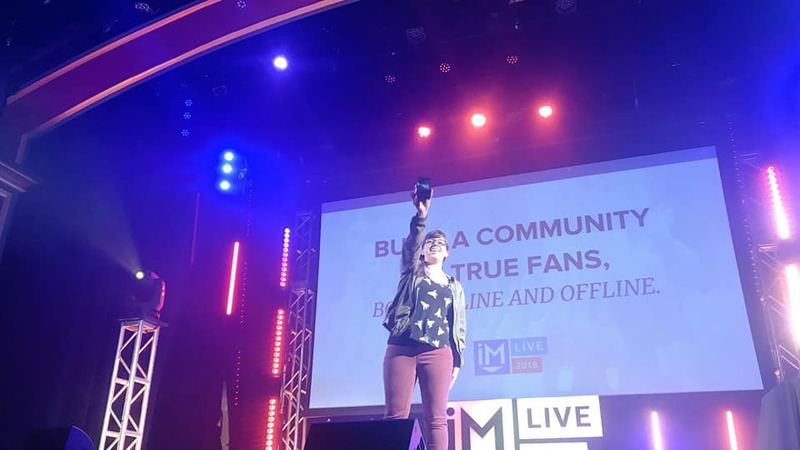 I spoke about building and maintaining an engaging community and one essential piece of that is defining the purpose of your group and who your ideal members are. I love how clear and concise that is — they want to be trusted, a place to share knowledge and learn, and the people involved are professionals. It’s broad but descriptive and doesn’t leave a ton of room for ambiguity (or spam). I’m looking forward to seeing what the future of LinkedIn Groups has to offer. Until then (and even after), I’ll still see you in Elite.